Many investing firms have become very curious about Apple shares recently. 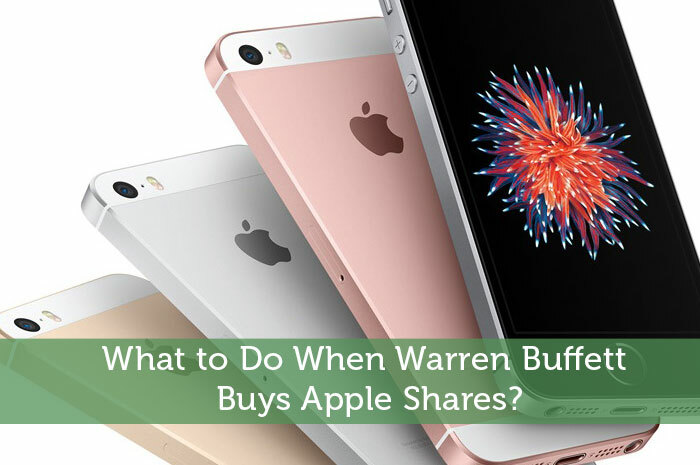 Since Warren Buffett, the most respected investor in Wall Street, announced the purchase of a large block of Apple shares few weeks ago, has made everyone wonder “why now”? Apple has lost around 30% of its price since last year. Last public results from the company showed a decrease in total revenue and profits due to a shrink in the company sales. China was supposed to be the biggest market for Apple which would allow Apple continue growing exponentially, but China is not a good market for apple. Chinese people don’t seem to like iphones and Apple hasn’t been able to maintain that growth. Our financial “guru” has decided to invest in Apple shares. That makes all think that maybe we have missed something. Makes us wonder if maybe there is something else hidden somewhere. Let’s see. The Apple watch hasn’t worked. It hasn’t changed the way we look at watches as the iphone did with phones. So we have the iphone (100% success), the ipad (100%), the iMac (Good enough) and then the rest of the stuff hasn’t performed as good in the market. Probably there are so many new projects going on at the back of the Apple lab. The top secret Apple car could be presented to the public before we imagine. We just can’t know if all these rumors are true or not. This brings us to the point where we don’t know how apple is going to do in the coming future. The best investor in the world thinks the situation will be favorable, but that’s it. If we want to adopt a conservative attitude towards this situation we need to consider that maybe God (W.Buffett) is wrong this time and Apple will continue to lose value for another year. What I am trying to say is that nobody knows the truth about Apple’s current innovative capacity to maintain that added value to their stock price. At the moment it is the top one technological company in the world in all terms. But that can change, as we have seen before with other companies like for example, Nokia. Nokia used to be the best mobile phone producer company in the world. Until 2007. When Steve Jobs launches the iphone. Apple takes over Nokia in sales in less than a year. Something completely unpredictable at that time, when Nokia would launch a new phone every few months. Personalized products where many different designs were made. Millions of phones sold of each model. The phone with biggest sales in the world it is still the Nokia 1110 with more than 250 million units sold. If we compare both companies Apple and Nokia, it is funny now to see how both reacted differently to the same problem. Between the years 2000 – 2002 took place the crisis of the “.com” companies. Technological companies that were pretending to change the way we would look at the world. The market created a financial bubble and many companies were looked as bluffs. Apple was one of these companies that suffered from the bad performance and not offering any real change. But Nokia, even if the price fell in 2002 with the generalized panick, continued as the market leader, reaching the 60 dollars again in 2007 when it started to fall, stabilizing itself around the 5 dollars. While apple was traded at 5 dollars in 2000 and fell to 1.07 after 2002. Not being able to rise again until 2007 when the jump took them all the way up to 130 dollars a year ago. Today is traded around 100 dollars. Will Apple follow the same path as Nokia did after its big success? Or it will reinvent itself to continue at the top? We cannot know, but we can wait to see what comes next and see if there is still any room for a rise in price. This respect everyone has for Buffett can change the natural trend of a certain stock because when he says he bought Apple then few minutes later Apple starts to increase in price. It was traded at 9 dollars just before he announced he’s bought Apple shares. Already risen to 100. Only time will prove him right. As a final thought, I like to think about what Buffett said long time ago in a conference. Warren Buffett only invests in companies he can understand. Usually he never liked technological companies because they were too volatile he said. But now he is beginning to see opportunities in technology companies. The entry into the capital of Apple became public after Warren Buffett himself confirmed that it will support the offer of Dan Gilbert, founder of Quicken Loans, by Yahoo. But Buffett also said he will only accept it “with appropriate safeguards”. Berkshire Hathaway already made a similar move when Burger King bought Tim Hortons coffee shops or recently in the merger between Heinz and Kraft.